271 years ago this month, on 10 October 1738, the celebrated eighteenth century painter Benjamin West was born in Springfield, Pennsylvania. Historical painter to George III and Surveyor of the King’s Pictures for many years, Benjamin West had first come to the attention of the King in 1762. While in Venice, West had met Richard Dalton, royal librarian, who was on a buying tour for the King and who commissioned him to create a painting for George III. This received much acclaim and, as a result, West moved to London in the hope of gaining further royal commissions. Intending to stay only for a short while, he ended up living in London for the rest of his life. From 1779 to 1801 he was engaged in George III’s many alterations to Windsor Castle, supplying several paintings for use in the royal chapel and audience chamber and creating designs for ceilings in the Queen’s Lodge. He also became involved with the large-scale restoration of St George’s Chapel under the surveyorship of local architect Henry Emlyn. As part of the restoration project, West produced an altar painting depicting the Last Supper and various designs for stained glass including the expansive East Window. The new window was created as a vast triptych, with three separate sections depicting the story of Christ’s resurrection. The central panel featured Christ emerging from the tomb, with the side panels depicting Saints Peter and John and the three Marys heading towards the tomb. The whole was surrounded by swelling clouds and abundant cherubim, making a dynamic and dramatic backdrop to the altar. The new East Window represented the latest fashion for vast picture windows, with large panels of glass being painted as if a canvas. This technique enabled the designers to create images which had expression and filled the whole space, without being broken up by lead supports. The money required for the new window was raised by a subscription fund from the Garter Knights, with £4042 10s being collected. Additional financial assistance was received from the Royal Family to fund this expensive endeavour. Subsequently, further windows were installed in the Quire Aisles detailing the story of Christ’s birth, showing the angels appearing to the shepherds, the Nativity, and the adoration of the Magi. The designs were drawn up by West, with the glass painted by Charles Forrest. The new windows received mixed reviews and by the end of the eighteenth century the fashion for painted glass was dying out, tastes were changing and what had been all the rage was now considered vulgar and out of keeping with the medieval surroundings. The first of the Aisle windows was removed in 1847 to make way for a new window by Thomas Willement. The East Window was replaced in 1862 as part of the Dean and Canons’ memorial to Prince Albert. Henry Poole & Sons of Westminster were employed to remove the eighteenth century glass in August 1862 [SGC XVII.61.22] and to pack it into four cases. A.Y. Nutt, Chapter Surveyor, remarked in 1878 that no satisfactory reply had been obtained as to where the window went or what became of the cases [SGC P.324]. The other two Aisle windows were replaced around 1869 as part of the new scheme by Clayton and Bell. Carefully numbered squared designs were created suggesting they were also packed away for storage [SGC P.110/52]. The whereabouts of these four windows is now unknown. 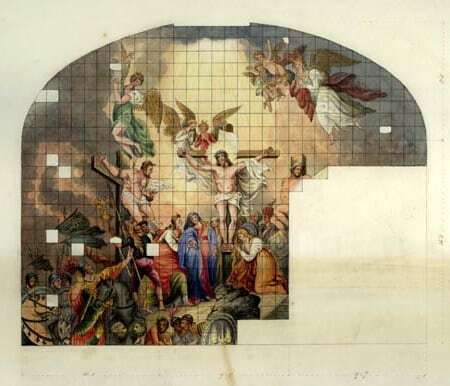 It is sometimes forgotten that Benjamin West also created a design for a new West Window. Depicting the Crucifixion, it was the last historical commission he would receive from the King. West was paid a thousand guineas for the cartoon and oil design of it, the highest sums he had ever received from George III. Unfortunately both these designs have disappeared, and the only surviving depiction of its intended appearance is this squared watercolour drawing, left by Charles Forrest on his death [SGC XVII.61.18a]. Although Forrest commenced painting the glass in 1799, it was still unfinished at the time of his death in 1807. Despite attempts to complete the commission, the window was eventually put in pieces into store. In 1846 it was taken out on the approval of Queen Victoria, and presented to the cathedral of St Paul’s in Calcutta for the sum of £500 [SGC XVII.9.4]. Less than twenty years later it was totally destroyed by a cyclone. The final piece of Benjamin West’s vision for the Chapel, the altar painting of the Last Supper, suffered a similar fate, being sold at auction in 1978 [SGC M.70]. In the same year a piece of eighteenth century glass was given to the Dean and Canons, which for many years had been in a veterinary surgery in Windsor. The donor, Mrs E.B. Bowditch, recalled that it had been salvaged from a pile of rubbish in the Horseshoe Cloister prior to the Second World War. The fragments show painted cherubs and scrolls and may represent the only surviving pieces of Benjamin West’s glass work for St George’s Chapel. These are now on display in the Archives.